TV presenter and Author Peter Walsh is one of the most well know people that could be considered a professional organiser . You have probably seen him on The Living Room. He is very likeable and great at what he does. But what does a professional organiser actually do when there are no cameras and lights and no extra helpers are not around… ? 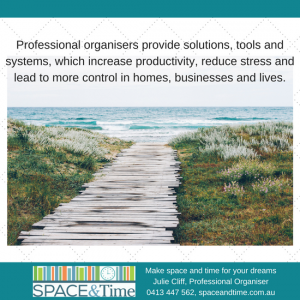 Professional organisers such as my colleague Angela Esnouf from Creating Order from Chaos have been working in Australia for over a decade (Angela specialises working with hoarders), so the industry is not as new as you may have thought. Professional Organisers create customised solutions to help others get organised. They help their clients find balance, restore order and maximise their resources. They provide solutions, tools and systems, which increase productivity, reduce stress and lead to more control in homes, businesses and lives! So what does that mean? You can use a Professional Organiser just as you would any other expert where you have difficulties tackling a task on your own. Need a pipe fixed – get a plumber, need to do you tax – use an accountant. 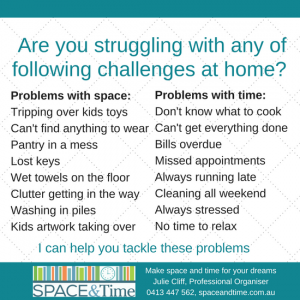 Need to tackle some of the below challenges – use a professional organiser. Some people are embarrassed that they can’t get themselves organised. But not everyone finds being organised easily. Including me. Life gets busy and keeping up is hard work. In the past I would sometimes get overwhelmed with too much to do. Consequently I taught myself how to be organised. I learnt the magic of how being in control of your routine, your stuff and your life can deliver huge benefits to your overall wellbeing. Personally, I love working with people that are overwhelmed by clutter and are time poor either at home or in the office. I love to help them decide what they want to spend more time doing and where they should spend less time. From there we put a schedule together so they have a list of things to do every day to make space and time for their dreams. I can help you with any of the above common problems at home or in the office. I am blessed to work as a professional organiser and make a genuine difference to people’s lives. Earlier in the year client Memento said “We sorted and put everything back into a proper and convenient space and somehow magically I have free space for the stuff from other rooms. Getting professional organising help is best thing I’ve done this year. Thank you Julie”. Read other testimonials here. If you would like a hand to tackle that task you have been putting off you can book me here. 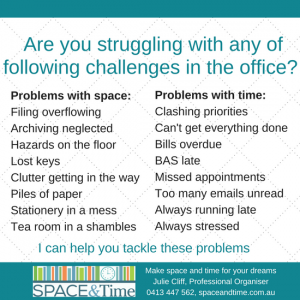 Or give me a call on 0413 447 562 to chat about the challenges you are facing at home or in the office. ← Get organised to beat the Winter blues!